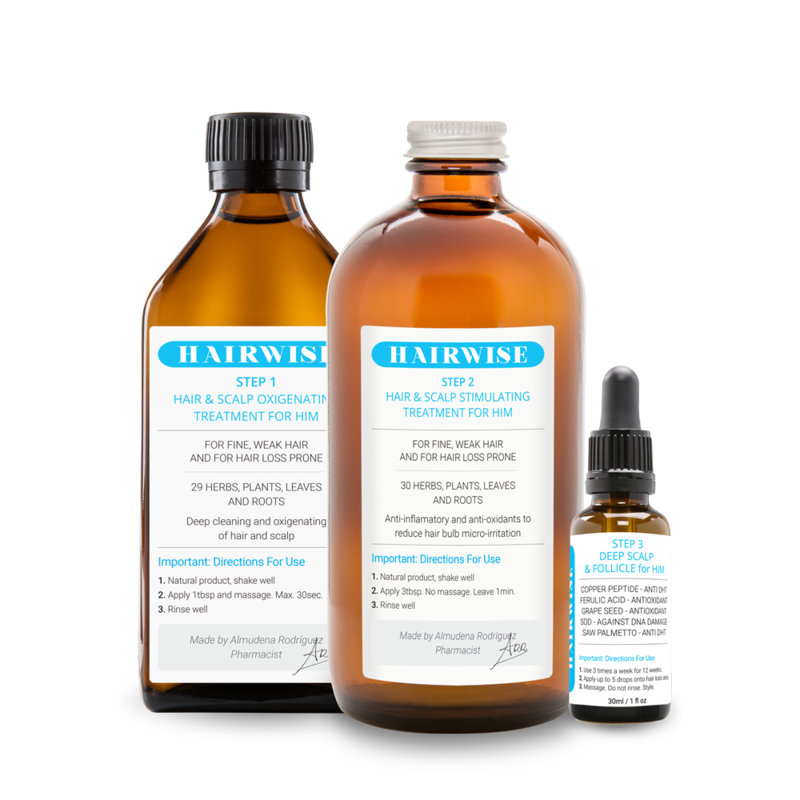 Hair Regrowth For Him | 490ml / 16.5 fl. | 265ml / 8.9 fl. oz. | 30ml / 1 fl. oz. This set is the result of decades of work selecting ingredients and mastering formulas. Three products working together in a true symbiotic interaction to help bring the natural balance of the scalp and stimulate the growth of lost hair. It’s a simple principle: to heal scalp inflammation, the most common factor for hair loss. Scalp inflammation leads to suffocated hair follicles and progressive hair loss. Just as a grove suffocated by weeds can’t grow fruit, a scalp suffering from inflammation can’t grow new hair. The scalp is a complex tissue with many individual parts–sebaceous glands, collagen matrix, hair follicles, etc. These are symbiotically interconnected; if one part becomes unhealthy it affects all the others. As such, hair treatments can only be truly effective if they bring balance to the entire system. Men’s hair loss begins with an abnormal high concentration of 5-Alpha-Reductase in testosterone. Hair grows progressively smaller and thinner at the scalp and temples. 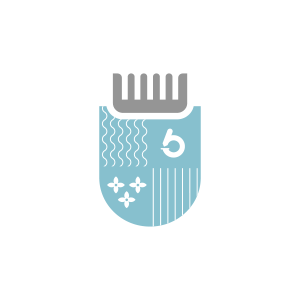 Dihydrotestosterone (DHT) shortens the growth phase of hair follicles; thus, new hair can’t achieve its normal size and thickness. The follicles that previously generated healthy hair now generate only fuzz; this marks the onset of follicle inflammation. Although the patient’s hair loss begins to accelerate, the streams remain active—so the hair follicle can potentially be reactivated—and thus it is possible for men to regrow new hair. • Increases blood flow and re-stimulate the hair follicle. • Supplies scalp and hair re-oxygenating ingredients. • Acts as anti-inflammatory and re-activates the dermal papilla. • Provides with botanical ingredient carriers. It has been proven to show visible results in all major causes of hair loss, including Androgenetic Alopecia and Areata Alopecia. Step 1. Hair and Scalp Oxygenating Treatment. – Shake well. Our products are natural. – Apply 1 tbsp and massage for 30 seconds max. Step 2. Hair and Scalp Stimulating Treatment. – Apply 3 tbsp. Do not massage. Leave for 1 min. Step 3. Deep Scalp & Follicle. – Use 3 times a week for 12 weeks. – Apply up to 5 drops onto hair loss area. – Massage. Do not rinse. Style. Step 1. Hair and Scalp Oxygenating and Detox Treatment. Purified Water and Ocean Water (Aqua), Juniperus Communis (fruit), AHA Fruit acid (passiflora quadrangularis fruit extract, citrus medica limonum extract, ananas sativus fruit extract, vitis vinifera fruit extract), Pinus Montana (needle), Pinus Silvestris (leaves), Zinc gluconate, Allium sativum, Citrus aurantium (bitter orange peel), Morinda citrifolia (fruit), Decyl glucoside (plant derived), Coco Betaine (coconut derived), Abies Alba (needle), Melaleuca Leucadendra (leaves), Melaleuca Viridiflora (leaves), Pimenta Acris (fruit), Salvia Officinalis (leaves), Coríandrum Sativum (fruit), Lavandula Latifolia (flower), Acorus Calamus (root), Carum Carvi (fruit), Anethum Graveolens (fruit), Lavandula Angustifolia (flower), Citrus Dulcis (orange peel), Citrus Medica Limonum (lemon peel), Myristica Fragrans (seed), Pinus Pinaster (leaves), Eucalyptus Globulus (leaves), Mentha Viridis (leaves), Thuja Occidentalis (leaves), Rosmarinus Officinalis (leaves), Origanum Majorana (leaves), Chamomilla Recutita (flower), Juníperus Virginiana (leaves), Tocopherol (vitamin E), Phenoxyethanol (preservative), Lemongrass (preservative from Cymbopogon Schoenanthus Extract), Honeysuckle (preservative from Lonicera Caprifolium). (seed), Pinus Pinaster (leaves), Eucalyptus Globulus (leaves), Mentha Viridis (leaves), Thuja Occidentalis (leaves), Rosmarinus Officinalis (leaves), Origanum Majorana (leaves), Chamomilla Recutita (flower), Juníperus Virginiana (leaves), Tocopherol (vitamin E), Phenoxyethanol (preservative), Lemongrass (preservative from Cymbopogon Schoenanthus Extract), Honeysuckle (preservative from Lonicera Caprifolium). Rosemary (increase blood flow), Zinc (micronutrient), Panthenol/Vitamin B5 (micronutrient), Orange essentials oil (re-oxigenation factor), Pyridoxine/Vitamin B6 (micronutrient), Peppermint (increase blood flow), Lavender (antioxidant & free radical scavenging), Thyme (antiinflammatory & normalize sebaceous gland activity), Copper Peptide (anti oxidant – anti inflammatory – reduce 5 alpha-reductase), Ferulic acid (antioxidant against oxidative stress), SOD (powerful antioxidant and free radical scavenger), Saw Palmetto berry (DHT blocker), Alpha & Delta Tocopherols (antioxidant), Phenoxyethanol (preservative), Lemongrass (preservative from Cymbopogon Schoenanthus Extract), Honeysuckle (preservative from Lonicera Caprifolium). Hair Regrowth For Her | 490ml / 16.5 fl. | 265ml / 8.9 fl. oz. | 30ml / 1 fl.... Remineralizing – Thin & Weak Hair | 490ml / 16.5 fl. oz.